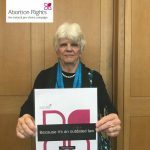 On the 10th of October, Abortion Rights held a public meeting with a panel discussion in Parliament. 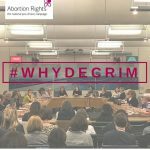 We bought together MPs, campaigners and healthcare providers together to the case of why abortion needs to be decriminalised across the UK. Abortion remains a crime across the UK, with a maximum sentence of life in prison. 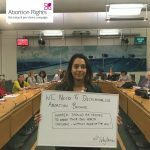 Abortion Rights called the meeting in response to the mounting pressure on the Government to take action to repeal Sections 59 & 60 and amend Section 58 of the Offences Against the Person Act 1861, which would decriminalise abortion up to 24 weeks in Northern Ireland and throughout the United Kingdom. 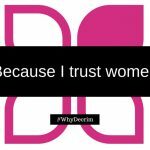 Free, safe and local access to abortion is imperative in modern society where one in three women have an abortion before the age 45. Abortion must be viewed as a medical procedure like any other medical practice. The enablement of a robust structure for healthcare professionals to provide best practice care for women is a cornerstone of society. 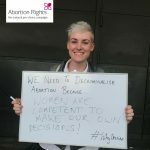 Public opinion polls display broad support across the U.K for decriminalisation as well Abortion Rights believes that abortion must be decriminalised immediately. 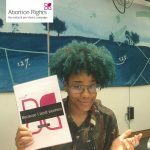 Ensuring all women in the UK have access to safe and accessible healthcare is a fundamental human right. Westminster has a responsibility to the women of Northern Ireland – a responsibility that should not be negated because abortion is a polarizing issue. Parliament is doing a disservice to the women of reproductive age in Northern Ireland and across the United Kingdom. The Government must act now. 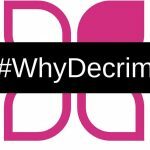 What is decriminalisation? What does it look like? How will it be achieved? Campbell says she was contacted by a woman who couldn’t travel because the abusive partner had burnt travel documents. Regan thanked Diana Johnson MP & Stella Creasy calling them massive role models for pushing forward the abortion rights movement. 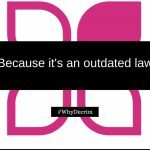 “The abortion legislation we use today dates back to 1861 – that’s before any women could even vote. The Bill will be debated on 23 October. Please write to your MP campaign postcards here to support the bill. Roughly 75% of people support a woman’s right to choose in Britain. fatal foetal abnormality – this has grown to 67%.